If you are a new homeowner in Orange County, or if you have owned a home (or condo) for years, at some point you’ll have to deal with a broken water heater. With modern technology has come modern options and the tankless water heater is now a popular choice. At Streamline Plumbing we are available to answer any questions you might have about choosing a tankless water heater. Call us today with any questions and to get a Free estimate. There are many benefits to installing a tankless water heater, but these are the most common aspects that homeowners will appreciate. Hot water that never seems to run out. Having a tankless water heater offers hot water even for the last person taking a shower in the morning. Clean and fresh water. By eliminating the standard tank to store water in, homeowners can rest assured that there is no risk of bacteria forming in the tank, instead you get fresh and clean water every time. Energy efficient and space saver. Getting rid of the tank to store the water in helps reduce the risk of flooding, and of course it’s a great way to save space. Tankless water heaters heat water on demand, so it’s very energy efficient. Tax benefits. Being a homeowner can be very expensive and every dollar you can save will add up. If you purchase a unit that has a 90% efficiency rating or better, you can receive a tax credit up to $300. Also be sure to ask your gas company about any rebates or refunds they offer. Like many plumbing products, there are many manufacturers to choose from when buying a tankless water heater. The easiest thing to do is to call Streamline Plumbing today and we’ll help you with the entire process. Some of the popular brands include: Bosch, State, Rheem, Bradford White and etc. If you notice an issue with your tankless water heater, like the hot water doesn’t seem as hot, or the hot water doesn’t last as long as it used to, or anything else that seems odd, then it’s time to call Streamline Plumbing. You can call us for a free estimate and affordable pricing. A tankless water heater requires two types of regular maintenance- check the in-line screen filter for debris and flush the unit to keep it free of scale and lime. Just simple maintenance like this can extend the quality and life of your tankless water heater. Streamline Plumbing offers a full service installation on water heaters, from removing your old water heater and installing a new tankless water heater system. 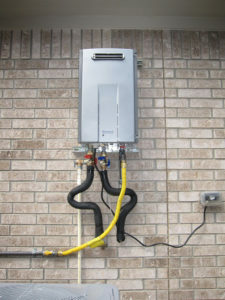 Some tankless hot water heaters claim up to 40% in energy savings. The energy efficiency is obvious: no storage tank equals no heat loss and no running water as you wait for it to warm up.